Sound recording studio began its operation on May, 31, 2005. Up to this time, the records of the Lavra singings performed by the combined choir of the Kyiv Theological Academy and Seminary students and the Lavra brethren under the conducting of archdeacon Dimitrios (Bolgarskyi) or hierodeacon Gerontius (Borysevych) were made by different sound recording companies. Besides, the records were arranged by the Educational Department of the Lavra headed in those times by hegumen Longin (Chernukha). In 2005, the necessity to create own sound recording studio appeared, where one could carry on own projects, reserve copyright of the Lavra to the projects made, and follow author and associated author-performer rights. Today, director Olga Starshevska and sound producer Oleg Petrov work on the staff of the sound recording studio, other colleagues are free-lance. The Lavra-performend prayers (molebens) with the acathisti were published. The CD with the prayer singing to Holy Great Martyr Barbara has been the first to materialize. The acathistus to Holy Great Martyr Barbara is held in the Lavra every Tuesday at 8 a.m.. The moleben with the canon and the acathistus to Holy Barbara sounds in the project. The research on studying the history of uncovering and translation of the Holy Great Martyr relics along with the article to be published as a separate book was made by Roman Shnurenko, the graduate of the Kyiv Theological Academy and Seminary and the National Music Academy named after P. Chaikovskyi. With the aid of almsgivers, new projects are implemented, such as “Joy of the Eternity”, “Here We Say to You, O Virgin, “Rejoice”, “The Easter of the Faithful”, other projects are planned. The opening of the own sound recording studio equipped by up-to-date facilities where one can record author projects, sermons, lectures of the Kyiv Theological Academy and Seminary teachers are on tap. 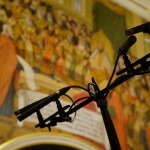 For choir recording, the Lavra churches famous for their outstanding acoustics will be traditionally used. The creative team of the sound recording studio is open for co-operation and sponsor aid.